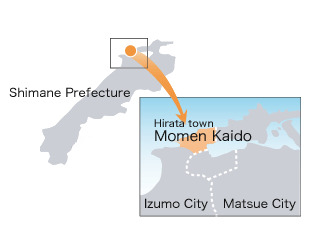 Hirata-cho, Izumo City, is located in the eastern part of Shimane-Prefecture. Lake Shinji is nearby and many waterways cover the area, including the Funagawa (“Funa River”) which runs from the west to the east. With its convenient transportation by boat as a means of distribution, the area became known as a market town, with goods from traditional merchant houses being transported in and out of the area. In the old days, especially from the end of the Edo period to the beginning of the Meiji period, the quality of “Hirata Cotton” was highly valued in Osaka and Kyoto, thus creating trade with those and other distant towns. 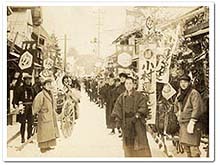 After that, ships often visited the area around “Funagawa”, which served as a trading center, and the area prospered as a busy market town. The many merchant houses along the main road supported and increased the prosperity of the town. Adjacent areas, including Shin-machi, Katahara-machi, and Miyano-machi, became known as the Momen Kaido, or “Cotton Road”, because the area was used as a channel for cotton distribution. Owing to the development of railroads and other means of transport, the popularity of Momen Kaido gradually faded. 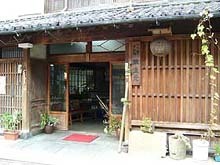 However, some of the traditional merchant houses and old buildings, such as a rice wine brewery (called “Saka-gura”) and a soy sauce brewery (called “Shoyu-gura”) remain, reminding us of the prosperity of the old days. The atmosphere of the old entertainment and residential districts is also still evident. 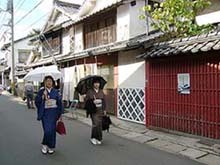 Unique appearances of buildings in Hirata include the two-storied “Tsuma-zukuri” town structures with rows of black-tiled roofs (Kuro-gawara), walls covered with square tiles jointed with raised plaster (Namako-kabe), and latticed windows (Kohshi-mado). Momen Kaido, now a mix of old town buildings and modern-day life, has become a culturally valuable place where people enjoy the feeling of the quiet and graceful nature of days past. 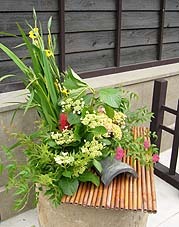 Momen Kaido is also much appreciated by the local inhabitants, who have organized and held various events in the area, including flea markets, arts and crafts exhibits, rice-cake making demonstrations (Mochi-tsuki), and concerts in an old wine cellar.